Search Vortex is a browser extension that computer users often install without realizing how it works. Even though, according to the information at searchvortex.info, the application is a reliable browser tool that can help you surf the web more proficiently, we recognize it as an advertisement-supported application. Can you trust it? We advise removing Search Vortex instead. Read the report, and you will find out how to delete this advertisement-supported program. Our malware researchers are well familiar with the developer of Search Vortex. SuperWeb LLC is the company that we have mentioned in our previous reports when discussing the removal of Clock Hand, CocoChaos, Web Waltz, PathMaxx, and many other unreliable advertisement-supported programs. All of these programs have the ability to communicate with remote adware servers and display online ads. 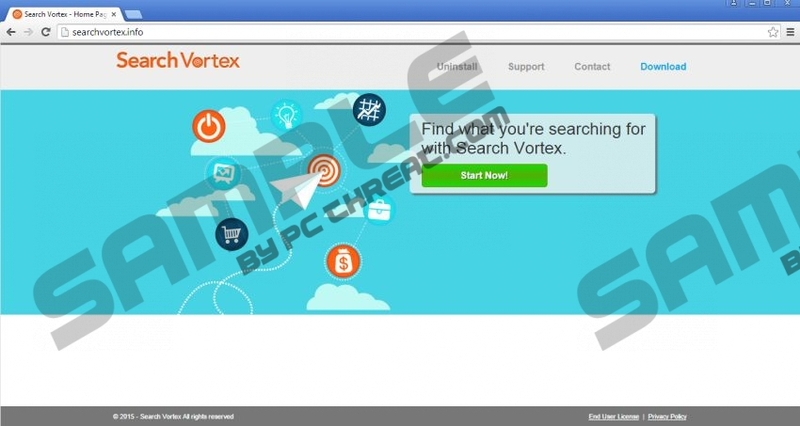 Unfortunately, there isn’t much information about the adware servers or the advertisers that could use Search Vortex, and this is why it is so important to delete this suspicious application. If you install Search Vortex thinking that the program will help you browse the web like a regular search tool, you are not exactly right. The advertisement-supported program is meant to collect information regarding your browsing behavior and then, based on it, display offers and deals that you might be interested in. Well, why should you remove Search Vortex if it presents interesting offers and deals? The thing is that these ads act as backdoors to third-party sites, and it is impossible to say what kinds of security issues you would face if you interacted with these ads. More malicious programs could be active on your operating system alongside Search Vortex. This application is usually spread using software bundles, and so it is highly likely that you might have to delete other applications as soon as you remove Search Vortex itself. Some of these programs could be invisible, and others could appear to be harmless. You should not make any assumptions until you run a malware scanner and figure out if certain programs require removal. We recommend removing all threats detected by a reliable malware scanner. Of course, you can try to discover these threats manually, but, as you probably know, this is extremely difficult. It might be just as difficult to delete Search Vortex or the related threats. An automatic malware removal tool can help you greatly, and so you should waste no more time and install it on your operating system. Click the Start menu button on the Taskbar. Click Search Vortex and hit Remove. Move to Uninstall a program. Right-click the program you want to delete. Right-click the app you wish to delete. Quick & tested solution for Search Vortex removal.